There was a mistake in the vocabulary. The pope of the Heavenly Demon Church isn’t a messenger of god. He’s the representation of god. The master of the Heavenly Demon Church, Gongson Chun Gi. He looked at the muscular old man that came to him, and grinned. His actual name was Wu Gyu Ho (右揆護). He was one of the three experts in the harmonious stage in the church, and he was also one of the people that served Gongson Chun Gi ever since the pope was a young boy. Guardian Wu sat down on the seat Gongson Chun Gi offered him. 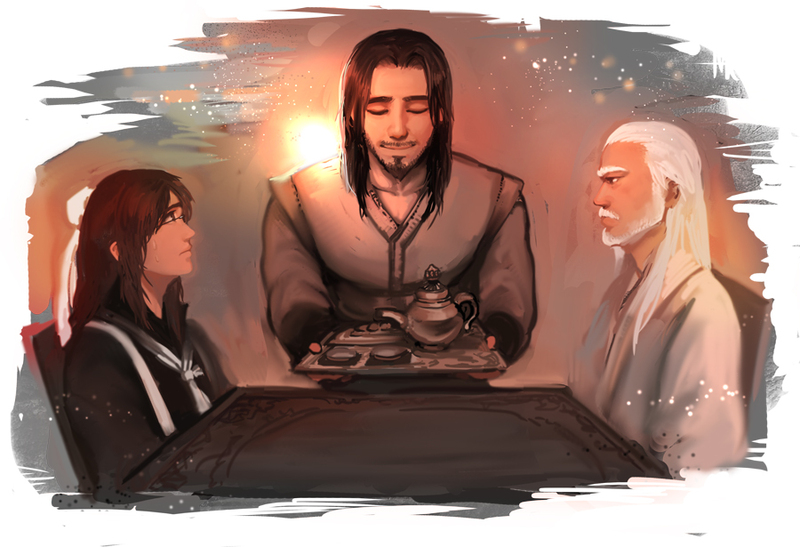 Gongson Chun Gi then took his teapot, and filled Guardian Wu’s cup. Guardian Wu anxiously gulped down the steaming tea, and spoke. When Gongson Chun Gi said that, Guardian Wu widened his eyes and denied it quickly. Gongson Chun Gi glared at Guardian Wu. When the old man avoided eye contact a little, Gongson Chun Gi opened his mouth. Guardian Wu made a surprised face, then quickly glared at the area behind Gongson Chun Gi. Lim Hak Gyum sweated a bit when he noticed the glare. How could he just go on and say that it was a lie, just like that? Guardian Wu was a harmonious expert. In front of his senses, Lim Hak Gyum’s skills would just be petty tricks. When Guardian Wu carefully said this, Lim Hak Gyum made a troubled face. When Guardian Wu laughed anxiously and shrunk back a little, Lim Hak Gyum spoke up carefully. When Gongson Chun Gi looked at Guardian Wu with a face that said, “I knew it”, Guardian Wu lowered his head and whispered a few words. Gongson Chun Gi sighed at the old man’s response. Guardian Wu spoke with a determined face when he heard Gongson Chun Gi’s words. One of the three sovereigns, the Dao Emperor. Gongson Chun Gi chuckled when he heard the old man’s words. The Blood Wolf Corps boasted the most power out of all the other corps, after all. Everyone in the corps were all peak experts. There were about five hundred of them here. Gongson Chun Gi poured tea into his teacup, and spoke. Gongson Chun Gi, unlike all the other popes in the past, belonged to the moderate faction in the church. This was a very revolutionary event, as something like this never happened in the church, where the blood and strength ruled over all. Guardian Wu just couldn’t understand the pope’s thoughts. If you compared the military power the church possessed currently to the past, you would see that the church currently was at the peak of its power. Even though this was the case, Gongson Chun Gi still forbade the church from making any major moves in the Martial World. Gongson Chun Gi once again nodded at Guardian Wu’s murderous words. Gongson Chun Gi stared at this excited old man for a while. Guardian Wu realized that this was a crucial chance. He wanted to persuade the pope for them to expand into the mainland now. Why would the pope create the Blood Wolf Corps, especially if he wasn’t going to use them? Guardian Wu just couldn’t understand what was going on in the pope’s mind. Gongson Chun Gi smiled playfully. The pope is definitely going to tell him to defend. He didn’t like this very much, but the pope’s command was absolute. Guardian Wu was thinking of taking care of all the experts in the Alliance if the chance came. The pope issued a weird command. Guardian Wu wasn’t sure of what he just heard. Guardian Wu wasn’t able to close his mouth. He was sweating all over his forehead. The pope seemed playful and lazy, but when it came to matters like this, he wasn’t the type of person to throw a joke. The strongest organization in history, the Heavenly Demon Church, just running from the enemy? With the pope here, at that? If this were to get out in the public……. Guardian Wu seemed like he was about to cry. It seemed better to just get massacred. Guardian Wu just sat there in a daze, listening to the rest of the pope’s orders. Cho Ryu Hyang was thinking about something. What she told him before he got onto the carriage was still lingering in his mind. His chest grew tight because of that. When his teacher asked him a question, Cho Ryu Hyang regained his senses. Teacher had an excited expression on his face. As this was a face he didn’t see often, Cho Ryu Hyang looked at his teacher with a curious face. The most complicated formation under the heavens. Was his teacher excited because of that? But what his teacher said next was something Cho Ryu Hyang didn’t expect to hear at all. The pope of the Heavenly Demon Church? Was this something to be this excited about? In the Martial World, he was known as an amazing expert, and was the leader of the strongest organization. It would be a lie to say that one wasn’t excited, but was it really worth getting as excited as his teacher, who was usually extremely calm? As if he read Cho Ryu Hyang’s expression, Jo Gi Chun spoke. A situation where too much power was given to a single person. That was what a religion was, and was what the Heavenly Demon church currently was. When Cho Ryu Hyang made a confused face, Jo Gi Chun began whispering. The fact that Um Seung Do was an amazing expert. Cho Ryu Hyang knew that best. He began to understand what his teacher was saying a little bit. But there was some other factor involved that made Jo Gi Chun really interested in the pope. Since a long time back, the imperial palace declared that the church was a demonic religion, and began to oppress the religion to a scary extent. But not once was the palace succeed in destroying the religion. They weren’t even able to sneak a peek at the shadow of the pope, even. But the two people here would be able to meet the pope with a method like this. Um Seung Do stopped the carriage, and opened its doors. They could see a large manor outside the carriage. This was the Gansu branch of the church, and was also the place where the pope was currently staying at. Cho Ryu Hyang was excited, too, it seemed. It was obvious for a person to be curious about a man that was said to be the strongest in the world. After going inside for a moment, Um Seung Do walked back out with a complicated face. Once he saw Jo Gi Chun and Cho Ryu Hyang, he hurriedly organized his expression and spoke. When they went inside, with Um Seung Do as their guide, they encountered two people. After taking Jo Gi Chun and Cho Ryu Hyang here, Um Seung Do quickly went outside. He determined that this wasn’t a place for him. The muscular old man whose black robe seemed like it would rip apart at any given moment. His defining features were his big physique, and his tiger eyes. That old man was wearing the Black Dragon Robe (黑龍布) and was looking at them in the chair placed in the middle of the room. And behind the old man, stood a middle-aged man who was smiling at them. The old man in the Black Dragon Robe spoke. Cho Ryu Hyang’s eyes shined. He began using his special vision to observe the pope. At the moment, Guardian Wu just wanted to drop dead. That was because he had to wear the Black Dragon Robe, and pretend to be the pope of all things. He couldn’t understand why the pope would do all this. Weren’t they just people who came to destroy a formation? They weren’t even martial artists, so was there even a reason to hide himself? Guardian Wu made a regal face again, and looked at the people in front of him. One old guy and one young guy. After looking at these two people, Guardian Wu began to wonder about something. The young guy was staring at the pope, instead of him. Guardian Wu wasn’t the only one that was surprised by this. It would be hard to say that the boy noticed, but this was still a bit strange. There was nothing that gave away the fact that the Gongson Chun Gi was actually the pope. The man barely had any presence right now. Compared to that, Guardian Wu really was fit to be a pope. You could feel the aura of a conqueror just by standing near him. Guardian Wu nodded a little, and opened his mouth. The moment Guardian Wu spoke, Gongson Chun Gi brought out tea and snacks at a frightening speed. Guardian Wu looked at all this anxiously, but Gongson Chun Gi performed everything naturally. When he was about to leave, Cho Ryu Hyang opened his mouth. Gongson Chun Gi easily pretended that he was Guardian Wu and introduced himself. Jo Gi Chun introduced himself as well, but Cho Ryu Hyang was staring at the man with a very serious face. The boy’s whole body was sweating, as he stared at Gongson Chun Gi. When Jo Gi Chun began to get a little confused. Gongson Chun Gi scratched the back of his head, and talked. Gongson Chun Gi took a look at the confused Guardian, and then began staring at the boy. At this, Cho Ryu Hyang went pale. Once he heard this question, Cho Ryu Hyang fainted. I realize that he’s eleven and has no natural talent for subterfuge, I’m just saying that if he wants to live and maintain his freedom he’s going to need to correct his behavior in certain respects. Argh the cliff it burns…. XD I read all these today and I noticed that they all pretty much end on a cliff though… I love this with unholy love!!! Thanks so much for all your hard work!!!!!!!!!! Thanks! Ah, i didn’t realise i had yet to read this! Well, this was certainly one of the chapters that were more interesting, in my opinion!